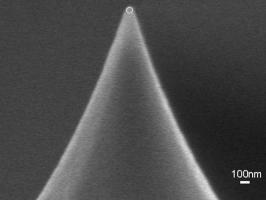 NANOSENSORS qp-BioAC-CI AFM probes are based on NANOSENORS qp-BioAC probes. 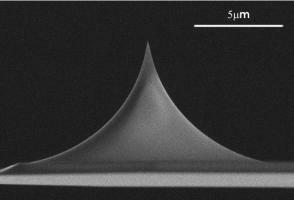 For the qp-BioAC-CI type the AFM tips have been rounded to a nominal tip radius of 30nm for Cell Imaging applications. This probe is dedicated to measurements on soft and life science samples only. 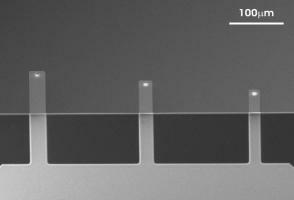 These probes feature three different rectangular cantilevers on one side of the support chip. The uniqprobe BioAC cantilevers unite fairly high resonance frequencies with low force constants. The unsurpassed uniformity of the mechanical characteristics of the uniqprobe series is particularly important for applications, where a large number of probes with known and near identical force constants or resonance frequencies are needed. The AFM probes of the uniqprobe series are especially adapted for molecular biology, biophysics and quantitative nano-mechanical studies.